Pravmir asked two matushkas (the Russian word for wives of clergymen) to voice their thoughts on what it is like to be a matushka. Both offered interesting and deep insights into the “backstage” of the life of a clergy family. Matushka Mary Holste is the wife of the Fr. Hermogen, who serves at the Nativity of the Holy Virgin Russian Orthodox Church in Menlo Park, CA, and the daughter of the Fr. Stephen Freeman, the popular blogger. She has been a clergyman’s wife for six years; she and her husband have two sons. 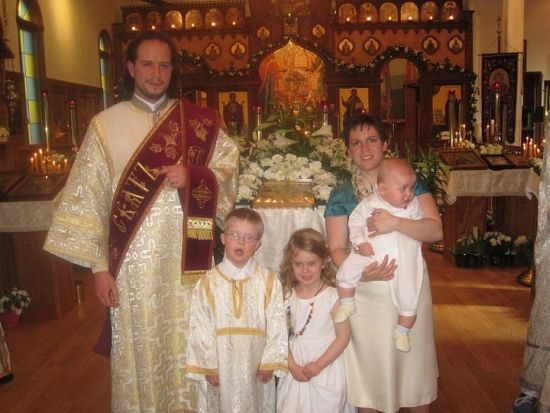 Their parish is one of several in the OCA that holds services primarily Church Slavonic in order to minister to the large number of Russians living in the area, although the parish naturally welcomes people of all backgrounds. Matushka Katherine Kallaur is the wife of Deacon Eugene, who serves at the Russian Orthodox Church of St. Seraphim of Sarov in Sea Cliff, NY, and the daughter of Fr. Elias Gorsky. They have two boys and one girl. Their eldest son was born with Down syndrome, yet with God’s help and his parent’s perseverance at age seven he speaks fluent English and Russian. Sophia Moshura: We will begin on a positive note. What are the joys of being a matushka? Matushka Mary: There are many joys of being a matushka. I like to think that even such daily tasks as making dinner and doing the laundry have an element of grace, knowing that I am doing this not only for the man that I love, but also for a priest who serves every day in the Lord’s holy altar. As the priest’s wife, I have the privilege of his insight and prayers every day. I greatly enjoy talking about his ideas, the books he is reading, and the needs of the parish. In church, I am able to hear his sermons in the context of our family life, which I think make them even more meaningful. Also, it is my very great joy to be involved in the life of our parish. In the USA, churches often have a strong sense of community. Members of the parish often know each other well and support each other through difficult times. 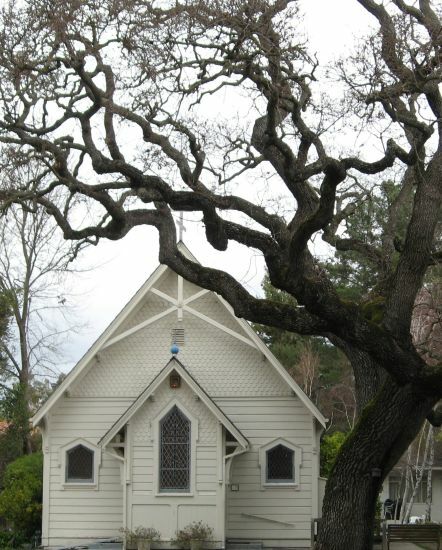 Typically, most parishes have additional building space next to the church where everyone is invited to gather for lunch or at least cup of coffee on Sundays after Liturgy. The children usually attend Sunday school, or “Law of God” classes, at this time. Different church members volunteer to prepare food for these lunches, to teach the children, to clean the church and decorate it with flowers, to sing in the choir, to work in the gardens around the church, to bake the prosphora, and in many other ways. As a matushka, I often find myself in the middle of all this activity, participating in as many ways as I am able. I love spending time with the parishioners and getting to know them as we work together to help the church. Matushka Katherine: I would like to start off by saying that in many ways I do not conform to the picture of a matushka, or what I perceive to be the picture of a matushka. 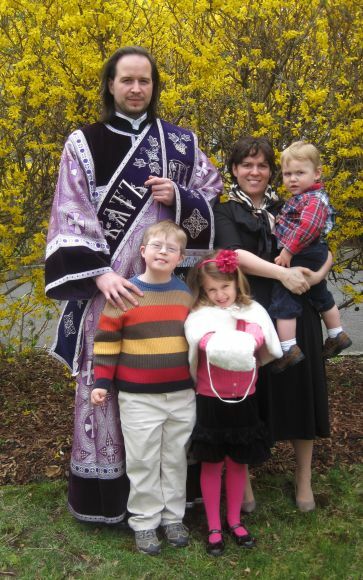 By definition, a deacon’s wife isn’t truly a matushka, so in America we’re able to keep a “lower profile.” Currently, besides being a wife and mother, I do not hold many responsibilities. I help where I can within the parish, and teach a class in the neighbouring parish’s Saturday Russian school. Much of what I write will be the product of my life and upbringing, and not the result of being the wife of a clergyman. The Russian Orthodox Church Outside of Russia (ROCOR) is a small Church, and my father is a priest, so I grew up surrounded by clergy. One of the nicest things about ROCOR is its approachable clergy and family feel. Most clergy and their families know one another. Our parishes tend to be smaller and, because most parishes were built by the hands of our own immigrant families, a sense of unity permeates parish life. I grew up in a very active parish, the Holy Virgin Protection Church in Nyack, NY. My family always attended church on the weekends and on feast days; it was never an option not to. When Fr. Eugene and I got married, we lived near Holy Trinity Monastery in Jordanville, NY. 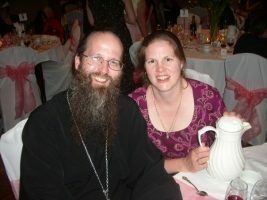 We lived there for over six years, and it gave us a wonderful base for living an Orthodox life. Fr. Eugene became a deacon after we had been married for more than three years, but before that he was always in the altar as a server and later as a subdeacon. Being married to someone who is devoted to the Church makes it easy to remain true to one’s values. There is no question about attending or not attending services. Instead of checking our social calendars before planning events or trips, we consult the church calendar. 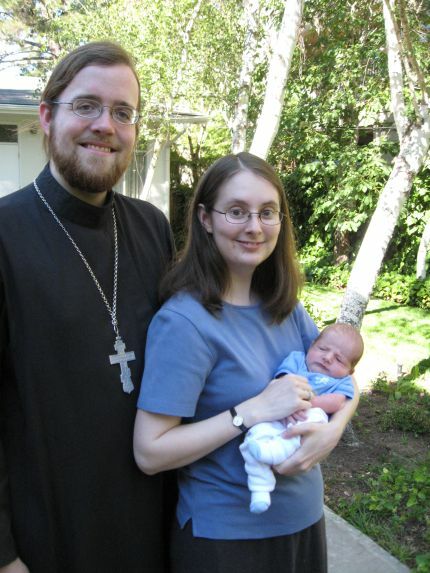 What is it like to be the wife of a clergyman in a non-Orthodox society? Matushka Mary: Although America is not an Orthodox country, I do not feel that the culture is hostile to our faith. The people we meet who are not Orthodox, even those who are not Christian, are generally respectful and even curious to learn more about our traditions. By law, our schools allow children to miss school for their religious obligations. Many schools around the country close for Holy Week, although now they call it “spring break.” Unfortunately, since we in the Orthodox Church calculate the date of Pascha differently from Catholics and Protestants, the break does not often correspond with our busiest week. But they do recognize the need for our families to attend the extra church services. When going out in public, Orthodox priests in America often wear their cassocks. We get a wide variety of reactions from strangers, who cannot help but notice the black robe and large cross. Sometimes they come up and want to ask questions about who we are, but most often people recognize that he is a priest and either smile, ask for prayers or a blessing, or occasionally glare at us in anger. I always assume that the ones who look hateful are reacting to some personal negative experience they had with a church or a priest. As a visible representative of the Church, priests and their families do sometimes attract this anger, whether or not they had any personal responsibility for the matter. It is an opportunity to show kindness and love to someone who has been hurt in some way. Matushka Katherine: I was fortunate to grow up surrounded by friends and cousins close in age to me, who all attended the same church. My parents kept us very involved in parish life and Russian cultural activities, such as Russian school and Russian folk dancing and singing during the school year, as well as Russian camp in the summers. Almost all of my closest friends to this day are Russian Orthodox. I have always striven to keep myself within the Church, and to keep myself surrounded by people who understand me and what I believe in. The non-Orthodox people that we do associate with accept us freely, and are interested in our ways (as long as we don’t push those ways onto them), but more because we seem like a novelty to them. They are also not very religious, so they don’t understand our obligations and responsibilities. For example, it is foreign to them that we fast, and they don’t understand why I cover my head in church. Moreover, although Americans tend to be very accepting of people’s differences, the more conservative one is, the less understanding they become. In what way does ordination affect a matushka? Does their husband’s priesthood oblige her to change her was of life, such as by keeping to a particular dress code or changing her lifestyle? Matushka Mary: I should qualify my answer by mentioning that my father is also an Orthodox priest, so this life feels very natural to me. Even so, I think that for most priests’ wives, the external aspects of life, such as dress and lifestyle, are not changed so greatly by ordination. There is no dress code except the general wish to dress modestly. Many aspects of life in a clergy family – such as attending more church services, fasting, preparing for Liturgy on Saturdays and other evenings, etc. – are things that, as Christians, we all strive to do as well as we are able. For a new matushka, they become, perhaps, more important in her life than they had been. It can be a big adjustment suddenly to find that we are in the spotlight. It takes time and grace to learn not to be self-conscious, not to wonder what people think of this or that. Also, I did sense a real change as regards the interior aspects of life, my spiritual struggles. Husband and wife are united sacramentally; they are one flesh. So in some intangible way, the ordination of her husband does affect the matushka as well. I sensed an additional gift of grace and an added spiritual burden, though I cannot describe it very concretely. As a matushka, I feel that I, too, am called to serve, to pray for the people in our church, especially the children, and to live in accordance with the Gospel as best I can. After my husband’s ordination, there was also a real change in the level of spiritual struggle for both of us. Spiritual warfare is very real, not just something in books, and the devil hates priests. We feel this most acutely during fasting periods, on Saturdays as we try to prepare for the Sunday Liturgy, and on the days leading up to the Great Feasts. Matushka Katherine: I am so glad you asked this question! When Fr. Eugene was being ordained, I was very happy and excited for him, but I did not think that my life would change very much. After all, my husband had been serving in the altar all these years anyway, and the ordination was the Holy Spirit coming down upon my husband, not me. However, on the day of his ordination, I realized that a husband and wife are indeed one, and that the Holy Spirit was within me too. I felt as if we relived our wedding that day. I do not have a special dress code outside of church, and I don’t believe my lifestyle has changed. Perhaps my life would have been very different if we did not live so much within the Church – but, honestly, I wouldn’t have it any other way. Although I sometimes wistfully look at those around me who are not so tied down to their parish, I would not trade my life for anything. Of course, when your husband is a member of the clergy, you have to remember who you are and what you represent. We are all human, but I believe a lot of laypeople hold clergy and their families to a different standard. Do matushkas have to work? Matushka Mary: It depends on the parish’s financial situation. Churches in America support themselves by the donations of the people who attend the parish; some supplement this with fundraising activities, such as festivals to sell pirozhki [baked bread rolls with stuffing] and other ethnic foods. Many matushkas do work to help supplement their husband’s income. Sometimes when there is a need, for example in new mission parishes, even the priest has to work a second job, although this is not ideal and is very difficult for him, for his family, and for the church. Matushka Katherine: There are many wives of clergy who do stay at home with their children, but that probably means that their husbands (and even priests, as well as deacons) hold a job outside the church. I was fortunate enough to stay at home with my children for almost four years, but this past fall I returned to work full-time. We are also fortunate that although my husband holds a job outside his responsibilities within the parish, he works for the Synod of ROCOR, so he doesn’t have to worry about taking time off for feast days. Our family is also fortunate in that we receive insurance through my husband’s job, because most parishes are not able to insure their clergy and their families. What are the sorrows of a matushka in America? Matushka Mary: I expect that our sorrows are probably similar to those of matushkas living in Russia or other Orthodox countries. The work of a priest in any country can be exhausting, both physically and spiritually. The matushka worries about her husband’s health, about whether he gets adequate sleep. I remember an anecdote about St. John of Kronstadt’s matushka, how she went to very great lengths to ensure he was not disturbed during the short rest he took each day. I think this story must resonate with every priest’s wife to some extent. It is a constant balancing act for clergy families to find time to spend together, while also giving proper attention to the needs of the parish. Chiefly, our sorrows are the sorrows of everyone in the Church. The priest carries these in his heart, and the matushka joins him by carrying whatever difficulties parishioners have shared with her. Most of the time, all we can do is pray with those who are suffering and to offer compassion. Sometimes God answers prayers in the way we would like, and we rejoice; but other times He answers only with His own Cross, suffering along with us in His great love, and resolution comes only in the Resurrection. Matushka Katherine: I would assume that many of the sorrows of a matushka here are the same as those of a matushka elsewhere. I can only speak from my own personal experience, and the sorrows that come to mind are more the sorrows of a mother who doesn’t get to attend church services as often as she would like to. I either arrive late so that my children behave well, or we don’t come at all because it’s too late for the children or too much for them. When I do come to church, I’m disciplining and teaching our children how to behave in church. The opportunities to pray in peace are few and far between. In our household, Fr. Eugene’s prayer time is sacred, whereas my prayers are mostly on the run, my heart calling out to God, asking or thanking Him as the day goes by. I always envy my husband the time he has in the altar, which doesn’t just include the services – he comes early to prepare and leaves late after helping to clean up and prepare for the next service. My husband also travels on church business, and even though it’s tough to manage three children by myself, I always support him. The trips are always for such a good cause and are such a great experience for him. Another point I would like to make is my sorrow that Orthodox society is increasingly becoming “watered-down” and de-sensitized to the spiritual world. I just finished reading the biography of my great-uncle, Fr. 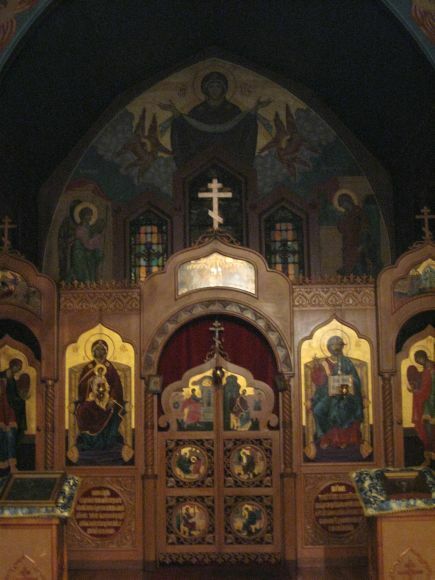 Seraphim Slobodskoy [author of The Law of God], and I was struck by the energy and accomplishments of immigrants who came to America with nothing, yet managed to build churches and grow parishes. Today, we can barely maintain that which was started for us not that long ago. People are not attached to their parishes the way they once were, and not many people are willing to devote their time and energy to the Church. If you have been to Russia, do you think that you differ from matushkas there? Matushka Mary: I have such wonderful memories from the time I spent in Russia. I spent a year in Siberia as an exchange student, but that was more than ten years ago now, and things in Russia are changing all the time. I would love to know what life is like for matushkas living there now. I do not know to what extent my impressions were accurate, or how life there may have differed from other parts of the country. I got to meet two of the matushkas there when they came to visit my pious hostess; also, I heard something about their lives from my conversations with priests. The clergy there were so kind to me, allowing me to sing with the choir on weekends, and even inviting me to join them for lunch after the Sunday services. My impression was that the lives of the matushkas there were extremely difficult. Their husbands sometimes had very little time even to sleep. One of the priests told me that it was not unusual for him to Baptize a hundred people in a week. And I think that it must have been very difficult financially for the clergy. One matushka showed me a sample of the beautiful lace that she and her children had made to sell at the outdoor market. Market vendors had to stand and endure long, cold days, but she only said how pleased she was that her children had been able to learn such a difficult skill. Another matushka I heard about spent most of her time working to grow and preserve food at their home far outside the city. Even when priests’ families had a secure financial situation, it must still have been quite difficult for them to raise small children in the Church. At that time, most clergy I knew seemed to have small children. Older priests were rare, for obvious reasons. Inside, the churches were often so crowded that I could barely move my arm to cross myself. Getting to church with small children by tram or bus in the cold would have been a challenge as well. My life here is different in many ways. We live, as many priests in America do, in a house located conveniently next to the church. Though we are not financially well off by American standards, I am able to stay home with my two children, and I never worry whether we will have enough to eat. Also, it is much easier for me to bring my children to church during long services. The church is full enough, but not nearly so crowded as what I experienced in Russia. I can easily go in and out when the baby cries. There is enough room for pregnant women, mothers with babies, and young children to sit when they need to. We even have a basket at the candle desk with little photo albums of icons and children’s Bibles that mothers can give them when they are having a hard time paying attention. After services, I usually stand near the door and speak to as many of the parishioners as I can on their way out. I always try to make people feel welcome and to answer questions whatever they might have. Many American matushkas do something like this. I think the smaller size of American parishes allows us to spend more time with each member. 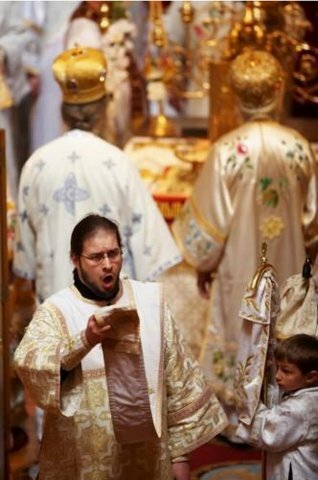 Perhaps, as more churches are built and more priests are ordained in Russia, this difference between us will be less. Matushka Katherine: I have been to Russia a few times, but not recently, and not as the wife of a deacon. My first trip to Russia was as a sixteen-year-old girl, in 1993. My last trip was in 2004, when I was pregnant with our first child. My contact with the wives of clergy was limited. In fact, although I may have met a few priests and deacons, I never met any of their wives. I am probably much different than a Russian matushka. I am more outspoken, I laugh too loudly, I dress too secularly, and I probably do not accept the will of God with as much humility. I am soft; I haven’t shared the hardships or responsibilities of Russian matushkas. What would you say to those who are going to become wives of clergy? Matushka Mary: I would encourage them to pray and seek God’s will. The Lord will not call a husband to become a priest or deacon without also calling the wife to be a matushka. There are many different ways to be a matushka; they are as diverse as the women themselves. But for all of us, it is important that we cultivate strong communication in our marriages, build friendships with other clergy for support and good advice during stressful times, and strive especially to be good mothers to our own children. Growing up as the child of a priest is a unique experience that requires special effort from parents. I feel so fortunate that I can always look to my own mother for inspiration and guidance in this area. Priests’ children can be very sensitive to the expectations of others around them. They often feel a great deal of pressure to be perfect, even if their parents are laid-back. It is important to set clear and reasonable expectations for them, to allow them to be themselves and know that we love them unconditionally. When disciplining them, we should be careful to avoid statements like “you embarrassed me today in church,” which send the message that we care more about our image than the behaviour in question. It is also very important to make time for our children, especially on the days when it is difficult, when church duties can seem unending. We call God “our Father,” and children learn about God’s love from observing their parents. This is even truer for clergy children. If we always have time for parishioners but not for them, the natural reaction is for them to blame God and to resent the Church. If we always allow the stress of preparing for Sunday to put us in a bad mood, they will learn to hate Sundays. Children in clergy families inevitably see the hard work and stress in their parent’s lives; it is our responsibility to ensure that they also see the joy and the love that we have in serving Christ. As a matushka, raising children who love God and know that they are loved is the most important duty I have. Sometimes people, very well-intentioned and pious people, may expect the new matushka to become a little “policeman” in the church, to go around correcting everyone for the way they are dressed, the way they cross themselves, etc. My advice on this point is to refuse respectfully but firmly. It often happens that when people come to church, especially new visitors, they can be very, very sensitive. This is a new beginning for them, and of course they feel vulnerable as they enter an unfamiliar place, intending to open their hearts and lives to God. I often meet people who, at some time in the past, were so offended or embarrassed when someone criticized their behaviour in church that they waited years before finally returning. If you absolutely must correct someone, first make sure that they feel truly welcome, that they know how much you care about them! People generally want to do things correctly and to fit in, and I find that, by simply waiting a few weeks, new visitors usually begin dressing appropriately on their own, or will ask someone to show them how to cross themselves, etc. Matushka Mary: Sometimes I think women are not fully prepared for what is going to happen to their family unit. Although your husband’s ordination will probably be one of the happiest days of your life, and one of the most grace-filled, it is also the start of a new position that you hold within your family. Although everyone knows that God should hold first place in one’s life, as the wife of a clergyman, you must accept that your needs are second to those of the Church. This may sometimes be a hardship, but the rewards are great. I also believe it is important to have friends who are wives of clergy, women who can understand and give support or advice in our unique situations. Can you please offer some advice to Orthodox mothers, not necessarily matushkas, who are trying to raise pious children in a secular world? Matushka Mary: I am still a young mother, but I will share some of the good advice I have received from more experienced parents, especially my own. First, let family prayers be a priority in your home. They can be short or long depending on the ages of your children and whatever time (or times) of day fit your family’s schedule. Bedtime might be a good time to begin. Let this be the one thing in your daily routine that never changes. If Papa has to work late, then say prayers together with just Mama, but don’t skip them. Let these family prayers be something that your children can participate in. Older children might enjoy being the one who reads the Psalms or the Gospel out loud. For young children who are working to memorize prayers with unfamiliar words, singing can be very helpful. Work to help your children understand the words of the prayers little by little, as appropriate to their ages. In our family, with very young children, we find it very helpful to add some very short, simple prayers at the end that they can understand and express in their own words. Something like: “I love You, Lord. Thank You for Mama and Papa and flowers and tigers and… Help me grow up to be brave and strong and good like St. George (or another favourite saint).” You can say the words for your child until they feel comfortable doing it themselves. Sometimes as parents we can work so hard to teach virtues like sharing and saying “I’m sorry” that we neglect to teach forgiveness, which is at the heart of Christian life. Model this essential Christian virtue to your family by freely forgiving and apologizing to your spouse and children. If someone has offended you in your family, don’t go to bed without making up with them. Make it your rule that everyone has to apologize, even if they think they are right. Finally, bring your children to church as often as you are able. This takes a great deal of effort, but it is your best gift to them and to God. Even babies who cannot understand receive grace from attending church. The candles, incense, icons, bells – they absorb all these things and learn reverence and love for God by being in church. Do what you can to make sure that young children are not extremely hungry, tired, and cranky when they get to church. You will be able to teach them fasting gradually as they get a little older. If your children are shy, they can feel overwhelmed by the crowd at first. For these children, coming early when there are fewer people can help, as is coming more often and for a short time at first, until the setting becomes familiar. Learn about the services so that you can whisper into your children’s ears an explanation of what is going on. They will also learn a great deal just from observing your attitudes about everything. Show your children that you consider church the most wonderful place in the world. After all, God is there! If you get excited about the beautiful icon of Christ on the Cross (“Look, see how much Bozhenka [God] loves us!”), then they, too, will assume it is exciting. And most of all: bring them to Communion as often as you can.